Not to be confused with "french fry day." Okay, Liz and Katie J? Sorry if I have you all now craving french fries. Yes, this is the first installment of my now (hopefully) weekly "French Friday." I hope this helps my astute readers to become even more well-rounded in your knowledge of worldly (okay, maybe just French-related) matters. Actually, I thought maybe it would just be fun for you to be a little "pompeux" (pompous) and surprise all of your friends by throwing in a few french terms here and there. Isn't it fun to be a little prétentieux (pretentious) sometimes? I'm just helping to make you all "très chic" and to give you that... "je ne sais quoi." (literally: "I don't know what" but means "something distinctive or attractive.") Wouldn't it be fun to be the girl of whom people say, "She has a certain je ne sais quoi." I'm extremely fortunate that my in-laws are "formidable" (wonderful). Since they all live far away, they sometimes come and stay for a week and I thoroughly enjoy it! 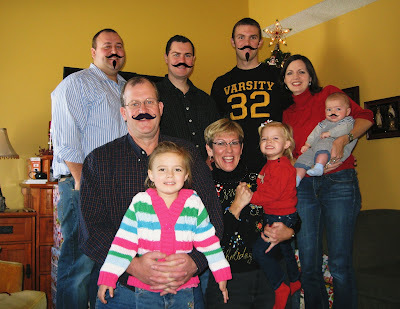 The men even cooperated by wearing french mustaches to go along with my french theme. How sweet. However, I know not all of you are as blessed as I am to have this type of relationship. But, maybe you would if you lived in France and always referred to your mother-in-law as "belle-mère." Do you know what that means? Yup - beautiful mother! And the same goes for your father-in-law - "beau-père" or handsome father. And if you have a daughter-in-law that you don't get along with, imagine referring to her as your "belle-fille" or beautiful daughter! And son-in-law is "beau-fils" or, you guessed it - handsome son. So, every time you'd refer to your in-laws, you'd be calling them your "belle-famille" or beautiful family! Doesn't this sound much more like a loving, healthy relationship than the term "in-laws." That pretty much just sounds like, "yeah, they're technically my family... but ONLY through the law... I certainly wouldn't have picked them..."
Imagine how your relationship would change with your mother-in-law if you were constantly calling her "beautiful." 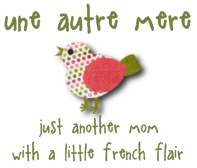 So here's my french "défi" (challenge) for you this week - The next time you talk to your mother-in-law / daughter-in-law, etc, purposely call her your "belle-mère" or "belle-fille," etc. And then tell her what it means and that you appreciate her/him (you can also do this with a father/brother-in-law). I'll even give you BONUS points if this exchange takes place with an in-law whom you find, um... "difficile" (difficult). *The following video has the pronunciations of the French words used in today's post. I did NOT want to do this. I tried to do just sound clips, but couldn't figure out how to do that. (Does anyone know?) So, please forgive the hilarity that is this video. For correct pronunciation of the french language, please see this article. love it!! you should totally give your kiddos aliases on your blog--obviously french ones :) tres chic! Whoa. I canNOT pronounce French words! I wasn't even close! I love the video. Even if you can do sound clips, please keep the video! How fun! My parents are spending the night tonight to help with the kids while Troy's speaking at a clinic tomorrow. I'm totally going to try out some French on them. I kinda think the "formidable" word is fun. Double meaning. Still your post would be classier if it were French FRY day. At least you can use this just once and maybe FRY up something French, ok? Hee hee hee. Super fun post. Maybe I do German Sun-dae in honor of my German heritage. You hawk your "r" so nicely. ;) Doesn't it bug you when people try to roll French r's like it's Spanish? Love French Friday!! Katie! I have no idea what just happened to your comment on my Saturday Evening Blog post, but I can't find it anywhere to reply to. I hope I didn't delete it, and it's just not showing up yet...whatever the case, I'll reply here. I have no idea if my button has a code or not. I didn't make mine, either, and I'm MORE clueless, I'd betcha. I'll try to see about adding a code to it (Good Lord, I have no idea how to do it!). I just posted it as a saved picture. Wow! I'm very impressed! I don't know a lick of french, but you sound very french-like! I'll admit... way too over my head. I did come back today just to see the cute video of yourself, though! You're very talented! I wish YOU had been my teacher in high school! I know...the age thing. What a fun lesson! I only remember: Je m'appelle Londa. Could you teach me in the next lesson how to say, "My brother is a fruit cake?" Thanks! I could use some ammunition!